The above map is an inaccurate map that roughly demonstrates the movements of mankind from Noah's home on Mt Lubar after the flood before the continents were formed after the destruction at the time of the Tower of Babel. The Shemites dwelt in the huge city of Sadek or Tzadek City in Gondwanian Tasmania (near Lebab or Babel). Sadek and Lebab were huge twin cities. The Hamites dwelt in Nahal (Black ) City in Gondwanian Africa and South America on the ancient Gihon River. The Japhethites dwelt in Adan (Red) City on the ancient Pishon River in Gondawanian Australia and Antarctica. Nahal would represent the southern tip of the landmass. Y-dna haplogroups A and B represent the movements of the Hamites out of Nahal. Y-dna haplogroup D and E represents the movement of the Japhethites out of Adan. Y-dna haplogroups C and F represent the Shemite movement out of Gondwanian/Pangaean Tasmania (Tzadeklebab). The Shemites of C and F haplogroup settled in Northern Australia in the land and city of Uruk Shadim. After the destruction of the Tower of Babel Uruk Shadim was ancient Western Australia. Eridu land and city in Central Australia were settled by the White Japhethites of Haplogroup E. The Neanderthals (Adanites) were Japhethites (Haplogroup D) descended maternally (mt-dna) from Adan the red bronze wife of Japheth. The Denisovans (Nahalites) were found among the Black Shemites of C y-dna and others descended maternally (mt-dna) from one of the daughters of Nahal the black wife of Ham. While Nahal passed her black skin colour on to her descendants her female lineage seems to have died out as has that of Adan who has passed on her bronze yellow-red skin colour. Some researchers believe that the Japanese Imperial House most probably belongs in Haplogroup D of the sons of Japheth who make up between 35-40 percent of the Japanese people, whereas I propose the Imperial line is more likely to be O2 ydna of the lost Israelite Tribe of Asher who make up between 25-30 percent of the Japanese people. About 20 % of the Japanese people also belong to the lost Israelite Tribe of Gad. Around 10% are male line descendants of Arpachshad-Charran and a small percentage are from the lost Israelite Tribe of Naphtali or Dan. In the period after the flood the sons of Japheth (D) settled through Pangaean EurAsia and were the first peoples in the Pangaean Far East and Japan. After the destruction of Babel and the splitting of the continents the Far East and Japan were settled by the Shemite sons and daughters of Arpachshad-Charran who intermarried with the sons and daughters of Japheth. After 600 BC the lost Israelites of Asher, Gad and Naphtali moved into the Far East, China and Japan. The Shang Dynasty represents the Arpachshad-Charran (Tang) impute into China who mixed with the Japhethites remembered by the Chinese as the Xia or Hsia Dynasty. Japheth was white like his father and brothers but his wife was of the red bronze colour. Japheth's red bronze son Madai married a daughter of Shem according to the Book of Jubilees. This was Yiskah the Prophetess who was Shem's granddaughter by his son Elam who married his sister or niece Shoshana (Susan). Yiskah's daughter Medea is most likely the M mt-dna ancestress and her sister Milcah (Melka/ Milkam) is the N mt-dna ancestress. Medea married her uncle Javan. Greek mythology remembers Javan as Jason. Their son Rodanim (the red one) would seem to have received the red bronze genes of his parents as did his sister Eriopis (or Europa) the mother of Minyas. Javan of E haplogroup with his family left the city of Adan and moved to Pangaean Greece and Turkey. At the time of the Ice Age some of the Japhethites of D haplogroup left the northern climes and moved into South East Asia (Sundaland). After the Ice Age they moved into China and the north. 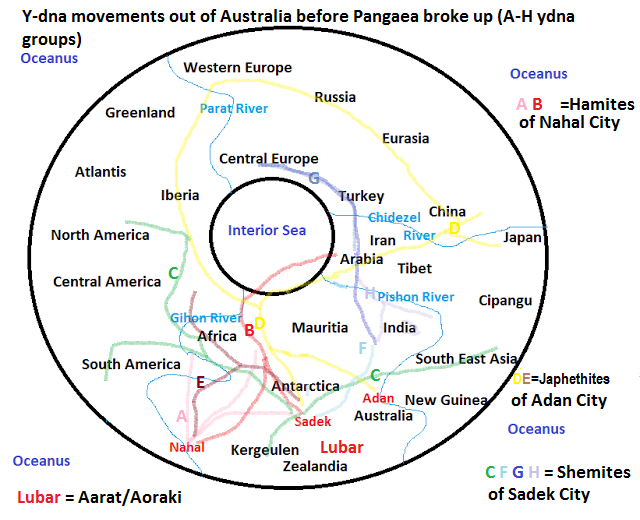 The bulk of humanity moved into Sundaland and Australia during the Ice Age while some were cut off from the rest of mankind in Africa (A and B ydna) and possibly South America (the original Australian Aboriginal home during the Ice Age). It would seem that the ancestors of these Australian Aboriginals were a group of the descendants of Arpachshad-Charran (C1 ydna) who moved from Sadek towards Nahal and married the black daughters of Nahal. They then moved into Gondwanian/Pangaean South America where they lived during the Ice Age that followed the destruction of the Tower of Babel. 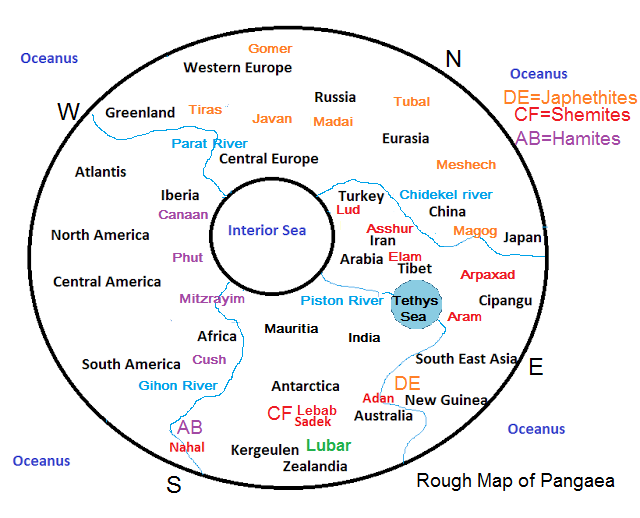 Some of these Black Arpachshad-Charranites, with the arrival of the Asiatic American Indians, went south into Antarctica to the Kergeulen Plateau. From there some of them went to India and the Andaman Islands and other islands of the Indian Ocean (now sunken under the sea). They mixed in India with the black Hend or Hindu of F* y-dna including F-P91 and F-M481 from Sundaland who had moved to India after 600 BC. The moon worshiping Haranites (or Sons of Lot) of H y-dna, the Edomite Amalekites of L ydna and the black sons of Keturah of R2 y-dna, founded the cities of the so-called Indus (actually Sindh) Valley Civilisation (1800-1300 BC) together. Around 1300 this civilisation was destroyed by nuclear war between the Moon (Mu) and Amu (Amalekites/ Amorites/ Martians of E-ydna). H1 and H3 y-dna is most likely of Moabite origin and H2 ydna of Ammonite origin. Some of F* y-dna (xHIJKLT) including F-P96 are the Khabaites (Chaborites) who descend from Peleg's brother Khaba and a son of Eber. They originated in Australia (Chabor) and Indonesia (Sundaland) before moving to India, Arabia and the Middle East. They were also known as the Hittites or Hatti in Turkey and as the Chaldeans in Mesopotamia. After the fall of the Chaldean Empire they moved on mass to India to the area of the modern Ganges River (then known as the Indus River) in the 5th century BC. Other descendants of Arpachshad (C ydna) remained with the other Shemites near Sadek and moved with them to Uruk after the destruction of the Tower of Babel. This group eventually moved into China and married the red bronze skinned daughters of Adan. Some also went further West into America. Adan the wife of Japheth had red bronze skin and red hair (like many of the Mongols) with green eyes. Noah, his wife and three sons and Shem's wife were blonde with pale white skins and blue eyes. Ham's wife Nahal was black skinned with black hair and eyes. Hi, thank you for your research and blogs! I do have a question on YDNA, in particular R1A. Is it from one of the sons of Noah or from one of the sons of Jacob? If Jacob, my understanding he is descended from Shem and Europeans from Japheth? I would like to hear your thoughts. Thank you. Dear Joe thanks for your comments. I believe that R1a is from Joseph and Jacob and thus Shem. I do not believe that the modern Europeans are from Japheth. The ancient Europeans from before the Ice Age were from Japheth but they then moved south and east. In the middle Ages the monks linked the Europeans to Japheth and his sons because they knew they had once lived in Europe and many of the lands retained there Japhethic names. Later Shemites arrived and the names became associated with them as well. Ok, great. Thanks for your knowledge! Thank you Catholic Jew, you really need to write a book! Another question, who do say was on Mars and Moon and other planets, other humans or Angels or some other type of being? Also, where did they go when the flood hit and God used their planets for that purpose. Thanks. Dear Joe, I don't believe in aliens. I do think these inhabitants on Mars etc were human colonists from earth both before and after the Flood at times when man had advanced civilisation. I believe the earth flood and the Mars flood occurred at the same time and that alot of the water that fell on the earth was from the ocean of Mars around 3,400 years ago. Many question what happened to the waters on Mars- I believe the bulk of them are here on earth. I actually think that the flood was man made through a cataclysmic war between two groups of humans who destroyed each other. However I am open to being proved wrong on this and any other of the opinions I hold that are not infallible teachings of the Church. If I did write a book it would be huge and have to cover a wide diversity of topics. Thank you. Do you think those advanced people were tied to the Egyptians/Babylonians and other earthly civilizations and do you think they obtained their knowledge from the fallen angles? Yes I do think that the fallen angels had a part to play as discussed in the Books of Enoch and touched on in Genesis. Besides an advanced civilisation before the Flood I also think that the civilisation that ended with the destruction of Babel was also advanced with colonies on moons and Mars. I also think there were advanced civilisations in the South which were destroyed in the time of Sodom and in the days of Joseph which may have been connected with an interplanetary on going war. I also believe that genetic experiments have been done on humans and that our racial colours may have been aided with some genetic manipulation to help with different environments rather than just random mutations. It all sounds a bit scifi but Solomon tells us there is nothing new under the sun. Yes, thanks. I just read where the have detected nuclear chemicals in Mars' atmosphere, the same ones we have from nuclear weapons only in Mars it is a huge amount. Obviously an indication of a nuclear explosion at some point on the planet. Dear Anonymous, All the male ydna comes from Noah and thus from Seth. The ydna Adam is most likely Noah. There is no surviving ydna of Cain but certainly Ham and Japheth's wives were descended from Cain according to certain Jewish ancient writings and legends. Neanderthal mans female mt-dna is most likely descended from Japheth's wife Adan and the Denisovian female mt-dna from Ham's wife Nahal. These direct mt-dna lineages seem to have died out and almost all if not all modern women descend from Shem's wife Tzadekbabel(Sadeka) on the direct mt-dna line. However the black colouring of Ham's wife and the bronze (yellow-red-brown)colouring of Japheth's wife have been passed down. Cain and Abel would have had the same ydna as Seth and Adam but no doubt he did pass on distinct mutations to his descendants but all these ydna Cainite lineages would have been destroyed at the time of the Flood. Dear Joe, That is very interesting about the nuclear matter and I believe that the same happened to ancient Australia and to the so-called Indus Valley civilisation. You've mentioned Neanderthals and Denisovans, but what is your opinion on Homo Erecti? Dear Kurt, I do not believe in the evolution of man from ape-like creatures. However I do believe in natural selection and a loss of genetic information due to mutations. I believe that Neanderthals, Denisovans and Modern Humans all descend from a common human mother called Eve. It is also possible that there is a fourth human maternal lineage descended from Noah's wife if she left maternal descendants after the Flood. I have as yet come to no conclusion about Homo erectus but they seem to be a de-evolution (if they are human remains) rather than the ancestors of Humans. Eu entendo a motivação pela qual você direciona sua pesquisa, fazendo uso apenas da Bíblia... nada contra, mas hoje a genealogia genética apresenta nos testes de DNA uma outra versão da sua, já é comprovado que há cohen em todos os HALOPGRUPOS J1, J2 E1b1b,R1b etc....com advento da genealogia genética a origem dos halopgrupos estão bem delimitados e já se sabe a origem certa de muitos deles, muito embora esses halopgrupos existam em todo o globo, a incidência maior em determinado local tem revelado ser ali o caminho de origem para a sua difusão para o restante do globo. Você não acha temerário se balizar apenas por "uma visão alternativa da história, genealogia, origens, lendas e genética com base em uma perspectiva bíblica e católica"?. Marcio, thank you for your comment. I use a Biblical time frame but that doesn't mean I base my research only on the Bible. I use all fields of research and knowledge but I do not interpret them within a darwinian evolutionary manner so I come to very different conclusions than those who do.